Okay, I’m on another kick. First it was roasted tomatoes: sauce, soup and meatballs; and then it was Meyer lemons in bread and preserves. This week I’m throwing key limes your way. Not actually throwing, mind you; I’m just not that aggressive. Plus, that could really hurt and it would be a waste of some perfectly good citrus. 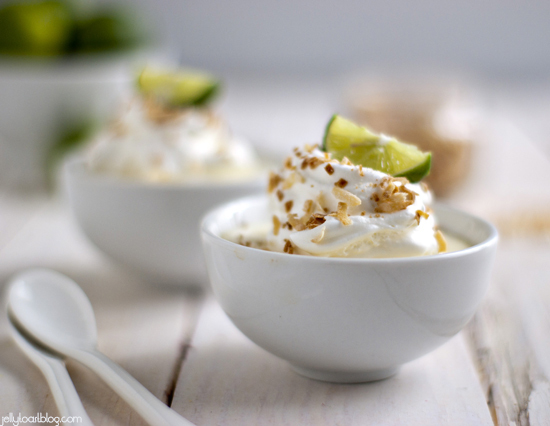 Key limes are much better put to use in yummy treats like these delightful little key lime coconut cheesecakes than to be thrown around like Wiffle balls. Do kids still throw Wiffle balls these days? Also, I totally just Googled Wiffle ball to make sure I was spelling it correctly and it says I am. My spell check on the other hand is having a field day. Nothing new there. I am the reason spell check was invented. 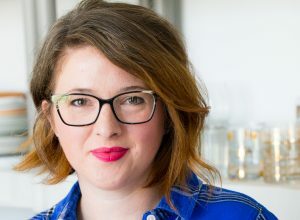 I had to Google the word ‘sandwich’ the other day to make sure it didn’t have another ‘h’ in it. I’ll just stick to my strengths and leave the spelling to the professionals. Man, that would be a weird job. A professional speller. I guess it starts young with the ‘bees’ and everything. Now lets talk about what you really want to talk about: these little cheesecakes. These were a spur of the moment creation brought upon by the need to use up two bags of key limes that I impulse bought last week. I’m not sure why I was compelled to buy them, but they were just so stinkin’ cute in their little ‘Susie’ bags (which is my sister’s name so it made them even cuter). Three blood oranges and a pomelo also found their way into my cart so clearly I was seeking out unusual citrus fruits. Not a bad thing. I figured these would make beautifully bright little cheesecakes paired with sweet and toasty coconut. And boy, did they ever. 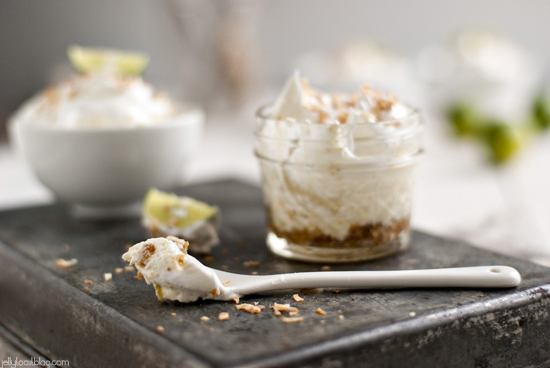 Think key lime pie meets coconut cream pie all wrapped up in these deliciously tangy goat cheese cheesecakes. The goat cheese adds an incredible depth of flavor and sophistication, but if you don’t groove on goat cheese, these little beauties can be made all cheese of the cream variety. I love the way citrus just brightens up the winter, don’t you? And remember how I said I was on a kick? This won’t be the last you see of my little key lime friends. 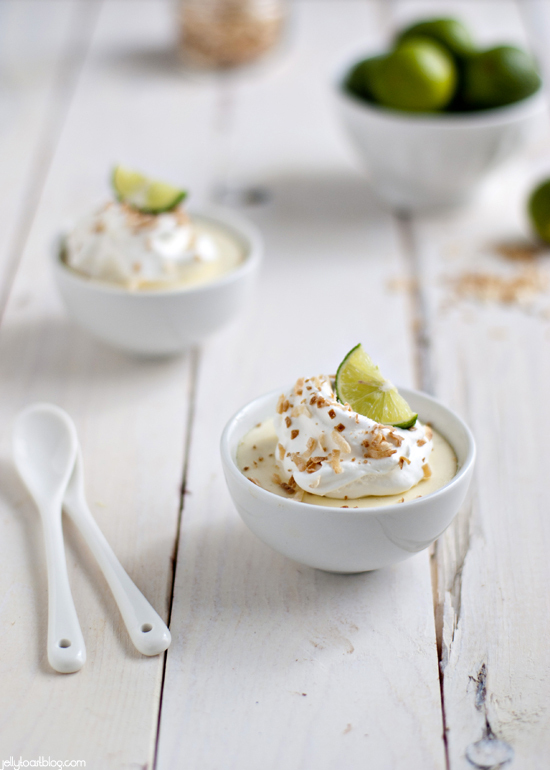 Stay tuned for more key lime-y goodness. 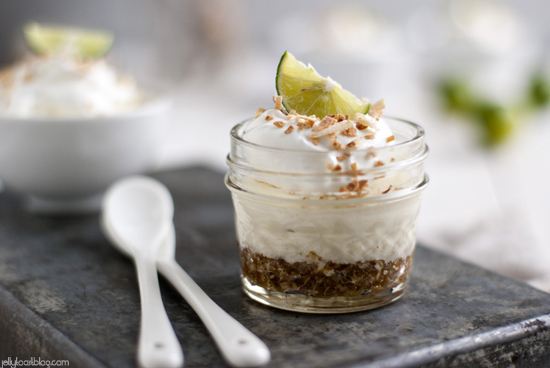 But in the mean time, go ahead and make these mini key lime coconut cheesecakes. You won’t be sorry. Preheat oven to 325 degrees. Butter the bottom of 10 - 6 oz ramekins (or other small oven safe cups) and place on baking sheet. Set aside. In the bowl of a food processor, place graham crackers and coconut. Process into fine crumbs. In a small bowl add crumb mixture, melted butter, 1/4 cup of sugar and coconut milk. Mix until evenly moistened. Divide mixture evenly between the prepared ramekins. Using a spoon, your fingers or a honey drizzler, press crumb mixture into the bottom of each cup. Place cups on baking sheet and bake for 15 minutes. Remove from oven and allow to cool. Reduce oven temperature to 300 degrees. In the bowl of a stand mixer, add softened cheeses and sugar. Beat until well incorporated. Add eggs one at a time, mixing well between each addition. Add lime juice, zest and coconut extract and mix for 30 seconds. Pour filling mixture on top if baked crusts. Bake cheesecakes on baking sheet for about 20-22 minutes. The centers of the cheesecakes will still jiggle slightly, but the sides will be set. Allow to cool completely. 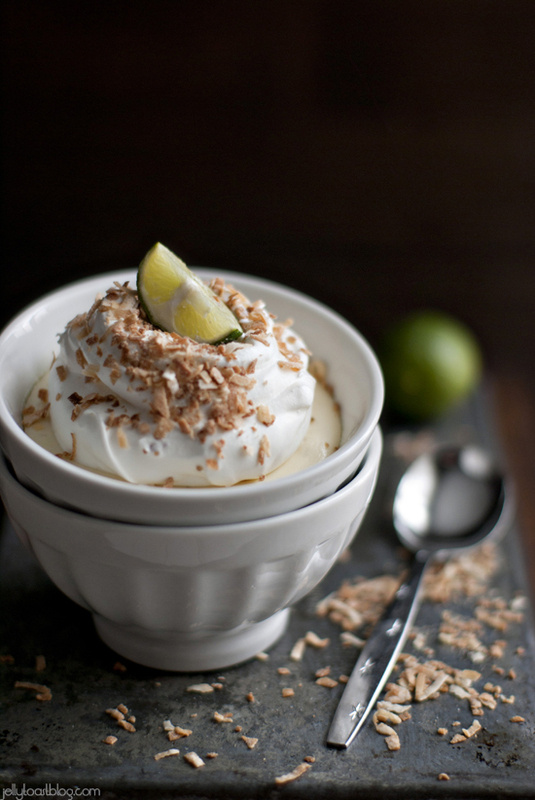 Garnish with whipped cream and toasted coconut. Ok, these look like the best dessert EVER. Send 1 or a million my way please? Seriously, Maggie, they are sooo good! Thanks so much for stopping by!! I love what you ended up doing with all those lovely key limes. 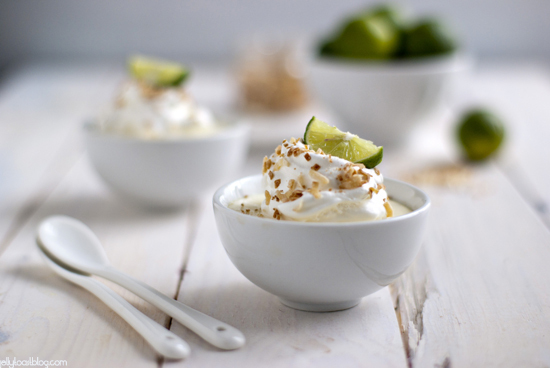 I adore the pairing of lime with nutty toasted coconut but you really made me swoon when I read that you used goat cheese to make these little beauties. I am a goat cheese freak! I’ve made cheesecake this way before and I love the way it tastes. Now I absolutely must make these. Perfection! Ha ha! Sandwhich!? I can relate. My hubby is a phonetic speller, so in order to understand what he wrote, all I have to do is read it out loud. It’s good for a laugh. Ha! I’m glad I’m not the only one. It’s a serious problem and I would be completely lost without spell check. Sometimes I spell something so incorrectly, spell check doesn’t even know what I’m trying to say, lol. Thanks for stopping by, Loretta!